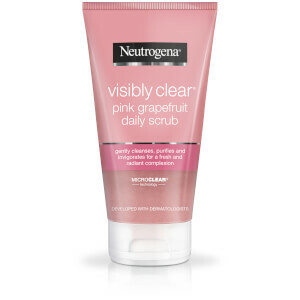 Reveal a refreshed complexion with the Neutrogena Visibly Clear Pink Grapefruit Daily Scrub; an uplifting daily face scrub that promotes healthier looking skin. Ideal for those with acne-prone skin types, the scrub utilises Neutrogena’s MICROCLEAR® technology, alongside naturally-derived exfoliators, which work in synergy to unclog pores, perform a deep cleanse and eliminate spots, blemishes and other imperfections. Without stripping the visage of essential moisture, the gentle yet effective scrub thoroughly purifies skin, whilst enveloping the face in a refreshing pink grapefruit fragrance. In the morning and evening, massage onto a wet face avoiding the delicate eye area. Rinse thoroughly. Avoid contact with eyes.